Railpictures.ca - Bill Thomson Photo: A personal favourite: Steam was still common on the CPR’s Galt Sub in August 1959. I was at Guelph Junction late on a Saturday afternoon to observe a westbound freight stopped for water by the station. Road engine was P3 Mike 5370, and “push engine” to assist was G1 2228 up front. | Railpictures.ca – Canadian Railway Photography – photographie ferroviaire Canadienne. 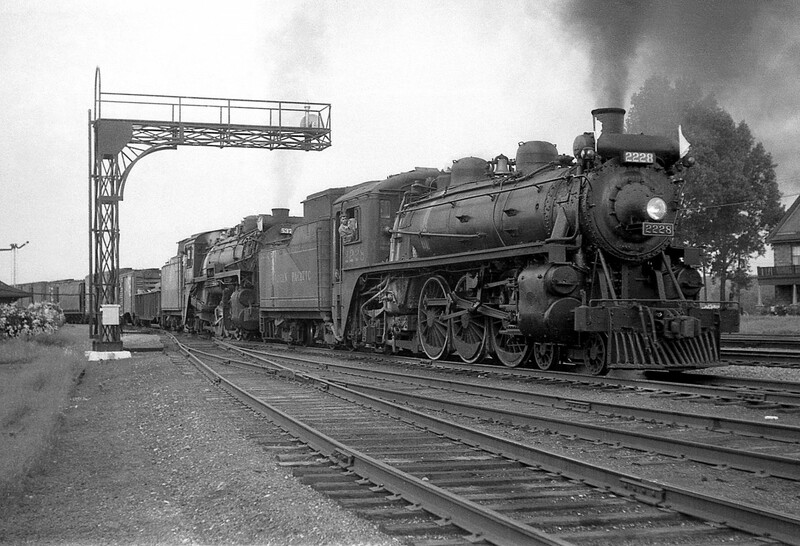 Caption: A personal favourite: Steam was still common on the CPR's Galt Sub in August 1959. I was at Guelph Junction late on a Saturday afternoon to observe a westbound freight stopped for water by the station. Road engine was P3 Mike 5370, and "push engine" to assist was G1 2228 up front. So when I saw this shot.. I was like darn – I just shot there back in the Spring! Darn close to the exact same spot and photo! Such a great shot from such a wonderful time. Doesn’t the world need a little more of this “pace”? This is now my personal favorite and only because you chose to share this with us. Thank you Bill! Wonderful.